The 26 County Taoiseach Leo Varadkar has admitted that British soldiers could return to the border through Ireland in the event of a crash Brexit in March. He also said that in such an event, Britain would have to reach a new deal with the 26 County state in order to honour its obligations under the 1998 Good Friday Agreement. The statements came as a surprised to the Irish political establishment, which had believed previous assurances that there would be no hard border as a result of Brexit, and that the Good Friday Agreement would be honoured in all circumstances. 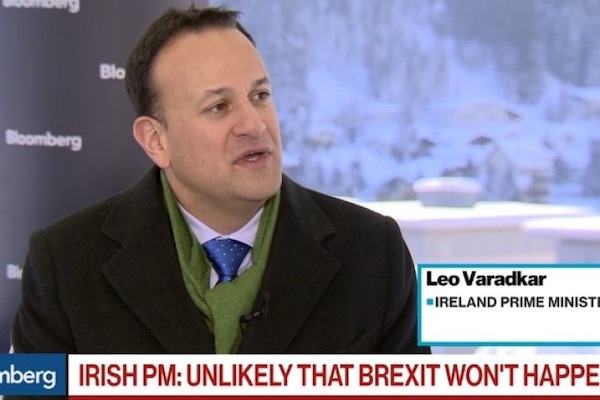 Speaking in Davos, Switzerland, Varadkar said in a no-deal scenario, a hard border “would involve customs posts, it would involve people in uniform and it may involve the need, for example, for cameras, physical infrastructure, possibly a police presence or army presence to back it up”. He told Bloomberg TV the border at present is “totally open” but if things went “very wrong” it would “look like 20 years ago”. It was the Dublin government’s first time to realistically warn of the implications of Brexit for the Good Friday Agreement. The comments followed the development last week that British Army reserves are set to be deployed to Ireland. Dublin officials later said the comments wre an indicator of their “frustration” at the British government’s failure to honour the ‘backstop’. That mechanism, which had been previously agreed with Dublin and the EU as a means of preventing a hard border, is being reneged upon by British Prime Minister Theresa May. Sinn Féin leader Mary Lou McDonald said the Taoiseach’s comments were “reckless and irresponsible”. “They are totally contrary to previous assertions regarding the government’s commitment to the backstop,” she said. In related comments, Mr Varadkar said there would be a “major dilemma” if there is a crash Brexit. “Both the United Kingdom and Ireland would have responsibilities to honour the Good Friday Agreement and the peace process,” he said. “So I think we’d end up in a situation whereby the EU and Ireland and the UK would have to come together and in order to honour our commitment to the people of Ireland that there would be no hard border, we would have to agree on full alignment on customs and regulations. His comments followed a report that the British Prime Minister Theresa May had offered to “amend” the Good Friday Agreement as an alternative to the backstop. British officials later denied the report, which originally appeared in the Daily Telegraph, and was immediately rejected by Varadkar. The Taoiseach indicated he felt he was coming under pressure this week to make concessions to the British, and that Ireland was being “victimised”.